Brilliantly made, this Straight Bourbon is intense and good with rich coconut notes, crème brulée, dried apples and pears coated with spices. Eagle Rare 10 years old is a Straight Bourbon of grand quality. This american Single Barrel is herbaceous with rich coconut notes and aromas of crème brulée, dried apples and pears coated with spices. 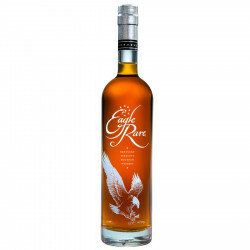 Carefully matured during 10 years, Eagle Rare has developped an aromatical palette of rare level for a Kentucky whiskey. It has been frequently rewarded, with 6 awards during 2016. This Buffalo Trace distillery's Bourbon is a must have. This high-quality Bourbon has a nice reputation with its complex and gourmet character with burnt and spicy notes of coconut, apples and pears. Symbolized by a white-headed Eagle, the "eagle" symbol of the United States, whiskey Eagle Rare is now presented in Single Barrel. Nose: complex caramel aromas, herbaceous notes and orange zest scent, honey, leather and roasted oak wood. Palate: bold flavors, spicy and dried oak with candied almonds and rich cocao associated with coconut, crème brulée, apples and pears. Silver Outstanding Medal - International Wine & Spirits Competition (England). Gold Medal, Best Age Statement Bourbon - World Whiskies Awards (Whisky Magazine).